"Without tariffs, we wouldn't be talking about a deal," said Trump, addressing "those babies who keep talking about tariffs." President Donald Trump touted his new trilateral trade deal Monday at a White House press conference, saying, "We're going to transform North America into a manufacturing power house." The United States-Mexico-Canada Agreement, finalized late on Sunday, will replace the North American Free Trade Agreement, which dates to 1994 and covers $1.2 trillion in trade. "Throughout the campaign, I promised to renegotiate NAFTA, and today we have kept that promise," Trump said during the Rose Garden briefing. 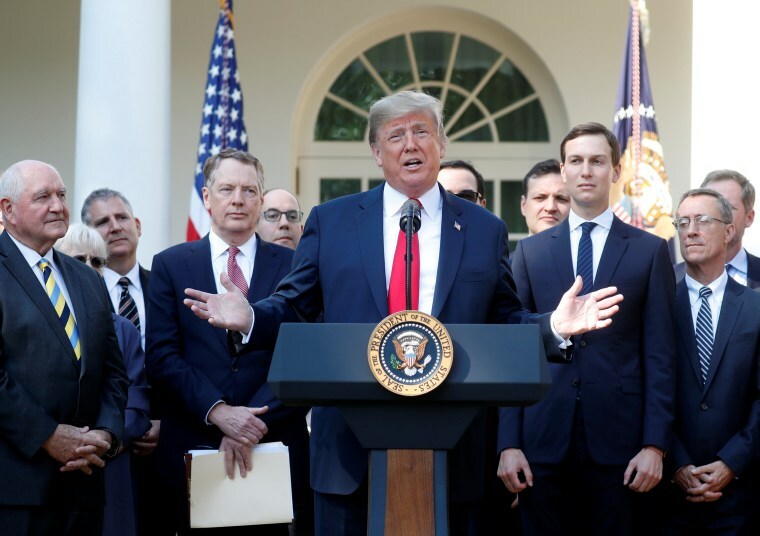 The revised trade agreement addresses wide areas of the economy, ranging from patents and financial services to farming and auto manufacturing. It will give American farmers greater access to Mexican and Canadian markets, said Trump, and requires that at least 75 percent of every automobile be made in America. “It will be the highest threshold in the world,” said Dan Ujczo, an international trade and customs lawyer who specializes in Canada-United States commerce. “For Trump, the main focus was about autos — increasing automobile production inside the United States,” said Michael O. Moore, a professor of economics and international affairs at George Washington University. This, plus extracting a concession from Canada that opens up the export market for U.S. dairy farmers, was a strategic focus likely driven by political as well as economic considerations, experts said. Other changes address and effectively update intellectual property rules to keep pace with the technological and scientific progress that has advanced over the past 25 years, and byzantine but contentious rules pertaining to an anti-dumping dispute resolution between the three countries and parameters for when corporations can sue a government rounded out the bulk of the changes in the new agreement. "Without tariffs we wouldn't be talking about a deal," added Trump, addressing "those babies who keep talking about tariffs." The president called the new agreement "the most modern, up-to-date, and balanced" trade deal in American history, adding that it offers "the most advanced protections for workers ever developed." That’s not necessarily true, according to David Dienesch, CEO of Euler Hermes Canada. “It does not appear that the deal has been modernized to the same degree as CETA,” he said, referring to the free trade agreement between Canada and the European Union. “It keeps the basic structure intact for free trade in a North American context,” he said of the new agreement, but falls short of addressing advancements in several sectors. “This NAFTA-type agreement still has a way to go to be more modern,” he said, countering the president’s claim. Nonetheless, the stock market cheered the new trade pact, with the Dow Jones soaring by 260 points in morning trading. The new treaty will need to be signed by all three nations and is set to be sent to Congress by the end of November.